Despite making some progress on "bread and butter" items, Foreign Affairs Minister Chrystia Freeland said differences remain between Canada and the U.S. on a number of key chapters of North American Free Trade Agreement (NAFTA). Despite making progress on "bread and butter" issues, Foreign Affairs Minister Chrystia Freeland said differences remain between Canada and the U.S. on a number of key chapters of the North American Free Trade Agreement (NAFTA). Speaking to reporters as the fifth round of negotiations concluded in Mexico City, the Toronto-area minister said "significant" sticking points include the U.S. push to change the rules of origin — which could be detrimental to the Canadian auto industry — and demands for a five-year sunset clause in the deal. "There are some areas where some extreme proposals have been put forward, and these are proposals that we simply cannot agree to," she said, while adding the U.S. position of these contentious issues, which were introduced in earlier rounds of negotiations, are largely unchanged. U.S. Trade Representative Robert Lighthizer issued a statement expressing similar pessimism Tuesday, saying he remains concerned with the "lack of headway" on some issues. "Thus far, we have seen no evidence that Canada or Mexico are willing to seriously engage on provisions that will lead to a rebalanced agreement. Absent rebalancing, we will not reach a satisfactory result," he said in the statement. When asked if Canadians should prepare for life without NAFTA, Freeland said Canada's position is to "hope for the best and prepare for the worst and Canada is prepared for every eventuality." Freeland said the addition of a sunset clause would be redundant as there is already an exit mechanism — by simply giving six months' written notice — that any of the three countries could invoke to leave NAFTA. Indeed, U.S. President Donald Trump has threatened to do so on a number of occasions, although, despite the rhetoric, he has kept his negotiators at the table through successive rounds of talks. For Canada, the sunset clause is one of its so-called "red lines," at least as it is currently written. "I've been married for 19 years, when my husband asked me to marry him he didn't say every five years we're going to check whether we want to get divorced or not. We don't think that's a good foundation for a lasting relationship," Freeland told reporters in the foyer of the House of Commons ahead of question period. Canada is reluctant to plunge the partners into protracted talks every five years, which would add a generous dose of uncertainty to the continental economy. Another area of disagreement is a U.S. proposal that would alter rules around autos. The Trump administration wants half of the content of all North American-built autos be produced in the United States and the broader, North American allotment to be increased to 85 per cent from 62.5 per cent. There is currently no rule governing U.S.-only production. The U.S. also wants to expand an existing "tracing list" to demand more products — including all steel — originate in North America. Trump has continually rallied against the loss of U.S. manufacturing jobs to Mexico and has proposed these stringent requirements to reverse the flow of work to the lower-wage jurisdiction and rebalance the country's large automotive trade deficit with its southern neighbour. But the Alliance of Automobile Manufacturers, a trade group of car makers operating in the U.S., including GM and Ford, has warned such requirements are too onerous and would actually lead to further job loss as companies could simply move manufacturing offshore to China — use whatever parts they want — and then export the car back to the U.S. paying a relatively marginal tariff of just 2.5 per cent. 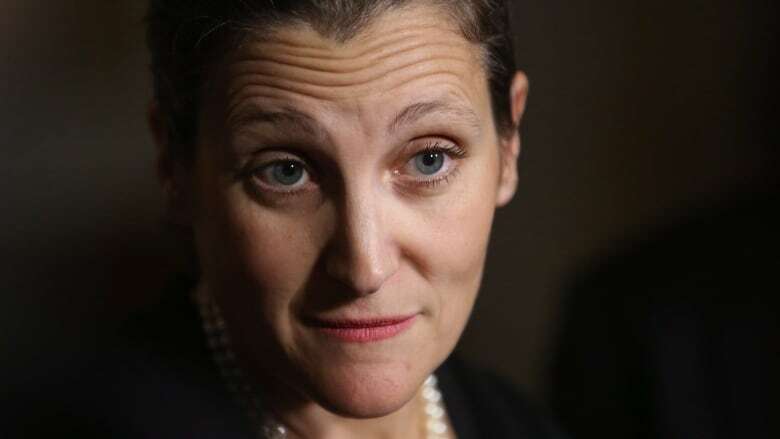 Freeland said both Canada and Mexico feel the plan is entirely unworkable, and would damage an already deeply integrated North American auto manufacturing market. "The net result would be negative for both of our countries," she said. Much of the "good progress" achieved at the latest negotiations in Mexico were on areas highly technical in nature. She said the three parties agreed to provisions on anti-corruption and good regulatory practices, telecommunications, areas relating to sanitation, and customs and trade facilitation.